“I’m looking for ways to develop intimacy with my live-in boyfriend without it seeming like I am following some program. Is there some “secret” way to try things without him knowing I’m doing it? “Are there things that can be asked casually to spark conversation? Are there ideas for spontaneous activities? Sounds like your partner is not really in to learning about relationships and trying some new things so you want to help him along without him being consciously aware of it. There’s certainly nothing wrong with wanting more in your relationship and nothing wrong in making some small shifts in yourself-trying some new things-to create more connection. We know that some people aren’t interested in reading relationship ideas and then putting them in to practice. We also know that they are usually with people who do-which seems to be true in your relationship. You can’t “make” your partner interested in going through a relationship program if he or she isn’t interested. What can be incredibly successful is for the person who IS interested in learning some new strategies –to actually start practicing them and see what happens. Who knows-your partner may even start to get interested if you casually start talking about them. So you want to know a “secret” way to try some things to deepen intimacy and get closer. We’ll do better than that-we’ll give you 3 ways to deepen your intimacy. 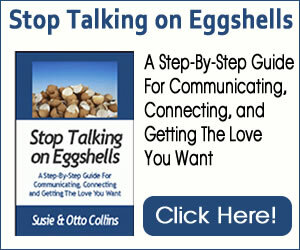 These tips are just a taste of we we teach in our 500 Communication Tips and Secrets program that is available at www.500CommunicationTips.com. *If you want him (or her) to come closer and don’t want to make a big deal out of it, try something as simple as opening your heart a little wider to him. In other words, when you think about him, picture what you love about him. Maybe it’s the way he touches you, or maybe it’s the way he walks in a room and looks at you. Maybe it’s the way you cook together or laugh together. It’s that simple. He won’t even know you’re doing it but believe us when we tell you that he will start noticing a difference-in you! *Open yourself to learning more about him instead of making assumptions. When he says something that you might think is wrong or pushes one of your buttons-don’t automatically say what you normally say in that kind of situation. Instead of saying “you’re wrong” or “That’s not right,” say something like this–“Can you tell me more about…” In other words, get curious and find out more information instead of shutting down the conversation with eye rolling or sarcasm. *Open yourself to noticing what you like and make it known that you like it. In other words, verbally appreciate him (or her) when something happens that you love. If he chooses to stay home with you instead of go out with the boys, tell him how great that makes you feel. Pretty soon he’ll get the idea without you having a long-winded conversation about it. It’s certainly not “wrong” to have those conversations about what you like-but it can be equally effective to show him what you like in this way. We invite you to follow these 3 tips and just see what happens. Just focus on enjoying your relationship and your partner and the rest will fall into place.